We gratefully thank Mr. & Mrs. Wilmer Reinford for their invaluable research and knowledge. Location: west side of Bridge Rd. (Rt.113) across from the Landis Rd. intersection (near airport). Along the north and west border of adjoining farm at 797 Bridge Rd., Skippack Twp., Montgomery County, Pa. Ownership: 1747-1774 Valentine Heizer, 1774 Yellis Kolb, 1825 Joseph Kolb, 1836-1874 David Wismer, 1874-1898 Daniel Wismer / lately of Scholler. The maps of 1848, 1871, 1877 all show D. Wismer owning this farm. The 1893 map shows "D.S. Wismer" with 51 acres. This may be Daniel, son of David. Description: Large farmhouse and barn on approximately 50 acres with a large wetland area. The land also fronts on Perkiomen Creek Rd. The house and barn sit about 400 feet back from Rt. 113. The research supplied by Rev. Wilmer Reinford shows the Heizer family to be the first owner to list their children of record, living on a farm of 160 acres for 27 years. It appears that David Wismer purchased lands of this original Heizer farm. It is unverified if a house was included in the deed transfer, however an expert review has found that parts of the roof system are much older than the 1800's. This may indicate the oldest portion of the residence being constructed during the Heizer ownership. The stone farmhouse had additions over the years. According to Mrs. Wilmer Reinford, who grew up there, the central portion of the home was the oldest, with smaller additions on each side. There was a steep pitched "A" dormer in the attic roof. 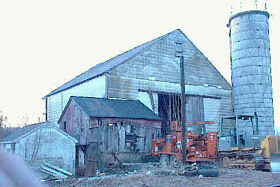 The barn had siding of random width boards. This was quite a serious turning point for the Mennonite religion and culture in the new world. Never before did anything so serious cause a break-up of the church, and among Mennonites who had suffered persecution together in Germany not too many years earlier. Skippack was the primary meetinghouse and congregation, also the location where Mennonite church policies were established in the new world. Given this, the struggle with Bishop Funk struck a heavy blow to Mennonites whose doctrine lead them to be nonviolent and somewhat pacifist, not taking a strong voice in politics. They may have thought that his ways and political support to a revolution could not be allowed to continue in the Mennonite church. One Funkite follower was David (R.) Wismer (1802-1875), the owner of this farmstead from December 4, 1836 to October 3, 1874 when he sold it to his son Daniel (S.) Wismer, the owner until March 25, 1898. Given these dates, it is likely that David grew up as a Funkite. His involvement in the Funkite church had him excommunicated from the Mennonites, as all Funkites were. He may have experienced the unfriendliness of the Mennonites towards the Funkites. It may also have been hard if the Wismer friends and family were split over their beliefs, with excommunication driving a wedge between them. It is possible that his large home served as a gathering place for the Funkites. As David Wismer became older, he established a cemetery on his farm, situated along Rt.113. The Reverend Wilmer Reinford, who grew up on a nearby farm, remembers local history saying that David Wismer was somewhat headstrong and not the type to "give in" or face the Mennonites even after the Funkite church died out. Therefore he was not considering to be buried with the Mennonites in their church cemeteries. He rather had a burial ground of his own. The cemetery has been designated as #90 on a list documenting cemeteries of Montgomery County. It includes members of the "Gotwals" family, such as Catherine Gotwals who Rev. Reinford believes was a daughter of David Wismer. A. 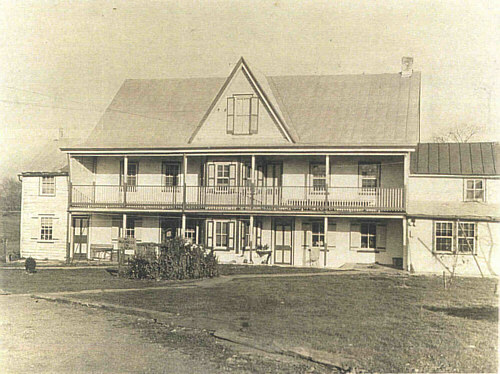 The David Wismer family farm was the only confirmed Funkite family location in Skippack. And it may be the only confirmed Funkite family location in the surrounding townships (as little or nothing was documented by the Funkites themselves). 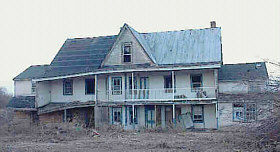 B. David Wismer's farm and cemetery was the only sign of the Funkite's existence at all in Skippack Township. The only sign existing nearby is the small cemetery near Evansburg, Pa.